Photo of the day: MY NIGHT WITH ANDY COHEN AND . . . CHER ! Photo of the day: MY NIGHT WITH ANDY COHEN AND . . . CHER ! – Last night, at 2:30 in the morning the vision of Cher ascending the staircase amongst the club goers at Club Marquee was not a dream, it was a dream, some would say come true. The goddess herself after spending the evening with Andy Cohen’s “Watch What Happens Live” show on Bravo, joined Andy in attending a ‘Cher Fashion Show’ while her music was blasting. Dressed in an Egyptian/street warrior type outfit, she and Andy watched with delight as she sang along to some of her songs. It was surreal to have Cher just a few feet away holding court over “her boys” and the Cher drag queens for Pride Week. 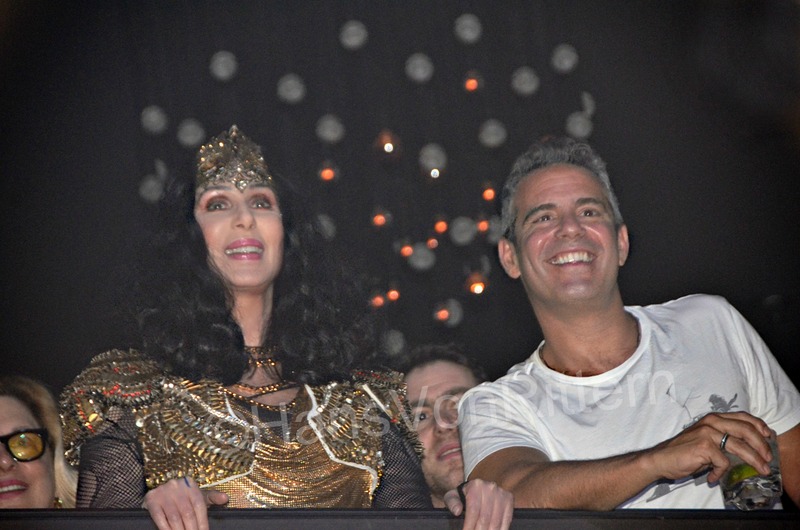 Andy Cohen was charged with energy as he couldn’t stop grinning with sheer delight at spending the evening with Cher. Neither could we! This entry was posted on June 28, 2013 by newyorkcityinthewitofaneye. It was filed under DAILY PHOTOS WITH STORIES OF NEW YORK CITY and was tagged with "my boys" gay fans, "You will keep me in sequins forever. ", 'Watch What Happens Live', 2:30am appearance, Andy Cohen, celebrities, Cher fashion show, Cher immitators, Cher joins crowd, Cher sings to her songs, entertainment, gay club, gay diva Cher, Gay Pride, Hans Von Rittern, her boys, Manhattan, Marquee Dance Club, New York City, New York photo, Photo of the day, Pride Week. Wowee!! How’d you get that ticket? ?